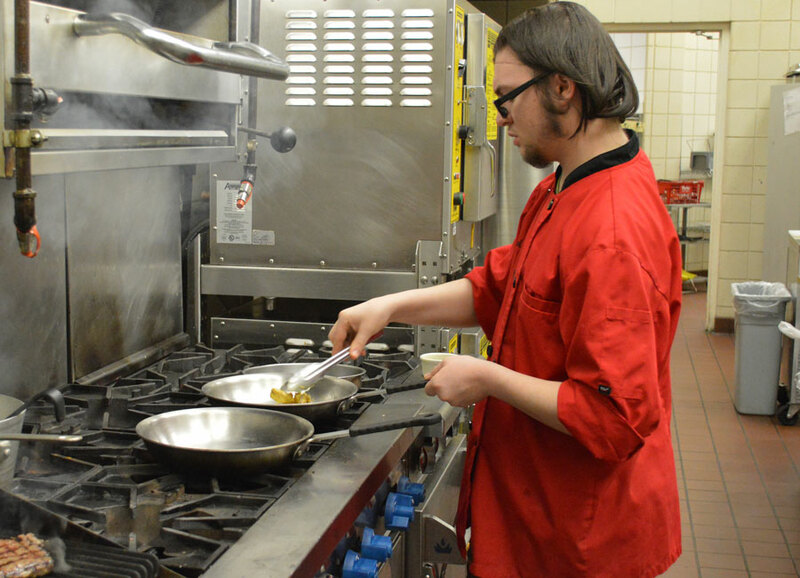 Michael Busz, a student in the culinary arts program at the Warsaw Area Career Center, serves as executive chef for the Blue Apron Cafe. 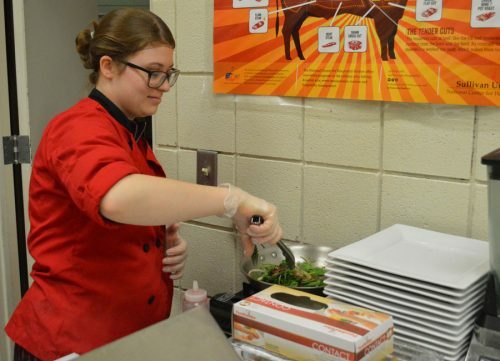 The cafe offers culinary arts students a real life experience in running a restaurant. The Blue Apron Cafe is open to the public from 11 a.m. to 1 p.m. Tuesdays and Wednesdays. WARSAW — Looking for a unique place to have lunch? Try the Blue Apron Cafe, a restaurant run by students in Warsaw Area Career Center’s culinary arts program. The cafe is run by students in beginning culinary arts, advanced culinary and hospitality classes. In addition to Warsaw Community High School students, the program has one student from Tippy Valley and one student from Whitko High Schools. In French cuisine the color of the apron of denotes the level of mastery. A blue apron is known as a student in training. Students in the program receive both high school and college credit through Ivy Tech. While in the culinary arts program, students earn 11 credits, two for safety and sanitation, three for basic theory and skill, such as making soups and sauces, three for baking and three for nutrition. Chef Mark Bragg has taught the culinary arts program for five years and the cafe was already in existence. This year there are 20 students in the two-year program. The cafe is open to the public from 11 a.m. to 1 p.m. Tuesdays and Wednesdays. Teachers and members of the public can email or call in their order for take out, if they don’t have time to sit down to eat. During cafe hours, students are in the cafe for three periods a day. Seniors are in the cafe third through fifth periods while students in the introductory class are in the cafe from fifth through seventh period. Students completely run the restaurant, from serving as general manager, to being wait staff, cooking the food and even washing the dishes. Everything served is made from scratch. When the cafe closes for the day, the students sit down for a “family time” and enjoy a meal together. Bragg said the menu changes a bit according to the season. It consists of salads, soups, sandwiches and even dessert. Students develop the menu and if something isn’t selling well, sit down to discuss the issue. Breana Mayer serves as garde manager, in charge of making salads at Blue Apron Cafe. She is shown making a warm spinach salad. Every three weeks students rotate positions in the cafe. “I love to see their success. That light bulb moment. When they can teach it to someone else, I know they have it,” Bragg said. A big part of the curriculum is on safety and sanitation. In addition to earning dual high school and college credit, students can also ear a manager serve safe certificate. The curriculum the culinary arts program follows is ProStart which was written by the National Restaurant Association. Students can earn ProStart I and ProStart II test which many culinary schools look for when it comes to admitting students into their program. During his tenure with the program, Bragg has had several students go on to continue their culinary education at Ivy Tech. Other schools that offer culinary programs include Sullivan which has campuses in Louisville and Lexington, Ky., and Johnson + Wales which has campuses in Rhode Island, Miami, Fla., Charleston, N.C. and Denver, Col.